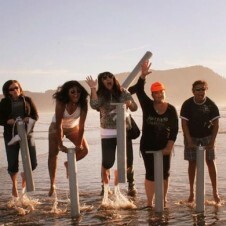 It was a warm weekend in the coastal town of Seaside on the Northern Oregon coast when women started arriving for the first annual EDEN Pacific Northwest. The women were excited as they unpacked their cars and wheeled their luggage into the Shilo Inn Oceanfront (30 North Promenade; 503-738-9571), the host hotel for the long weekend on the beach. The weekend attracted upward of an estimated 40 women, an intimate gathering for the first year of the all-girl getaway, but that’s what made it so unique. The women were ready for bonfires, laughing and dancing at night and clamming, hiking and shopping during the day. They weren’t disappointed. Posted October 24th, 2014 & filed under Travel.